The story follows a small community of neighbors who band together in order to survive any and all potential threats that could present themselves as government, law, and society starts to collapse around them. It follows their point of view in a rural area of the country, so we don’t actually witness the collapse itself, but learn of the events as the characters do through news and radio reports, as well as through family and friends that they’re able to connect with throughout the story. This gives the reader such an uneasy feel of just how isolated and “out of the loop” one might be should society fall apart in this way. But I do love how the neighbors, adhered together faithfully by the main characters Matt and Destiny, remain positive and helpful of others throughout the crisis. 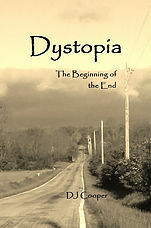 The author does well to show the dark side of some humans falling into despair angiving into their greedy side by taking advantage of the lack of government restrictions, but also the good side of humanity through the main characters who not only remain diligent about keeping themselves safe and healthy, but in how willing they are to take care of those who are in need, and possibly unable to fend for themselves. It gives you a sense of undying hope in an otherwise despondent setting. I thought the author’s display of this light in the darkness is what really makes this book worth reading! Now there are a bit of editing and formatting issues with this book, and the writing skill itself could use some work. These issues are usually what turns me off of a piece of fiction, but I still gave this four stars for a very specific reason other than what I mentioned in the paragraph above: interestingly enough, there’s a nonfiction element within these pages that kept my interest despite the issues that usually bother me. Ms. Cooper clearly has a wealth of knowledge regarding basic survival methods, from cooking without a fire using the sun and aluminum foil to all other tips and tricks one can use to take care of basic needs in the event of an emergency. Though I personally don’t foresee a collapse in society anytime soon, the information is still great to have (I mean, you never know, right? ), and as I’m an avid backpacker, I found a lot of it useful anyway! Some other readers may think, “Well then why doesn’t the author just make a nonfiction book about prepping?” I’ll tell you what. There are already a lot of books out there on survival tips, ultra-lite backpacking, prepping, etc, and there are many who like to read informative nonfiction. But there are many who have an easier time keeping their attention when information is given through a creative story form, which is what’s done in The Beginning of the End. This makes the book one of a kind, and I think anyone interested in the subject will get something out of this story! I for one, look forward to the next book, which I believe tells the same story but in the point of view of one of the major city’s evacuees. Can’t wait! Thank you, Ms. Cooper, for this very interesting and educational story!